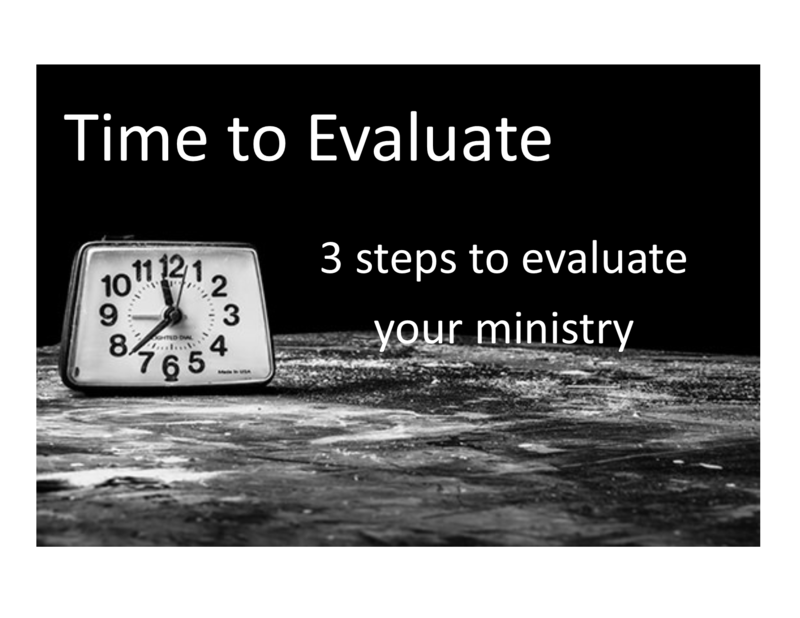 Is it time to evaluate your ministry? January brings with it an end to one year, and the beginning of another. September is the beginning of a new school year. Spring is the time of new beginnings, new life. A time when the cold, wintery weather and frozen ground gives way to budding flowers and gardens full of vegetables. These are all great times to evaluate your ministry, but you don’t have to wait. Any time can be a good time to evaluate your ministry. Evaluation is a time of reflections of past success as well as past difficulty. It is also a time of planning, goal setting, and excitement looking forward to a year full of endless possibilities. Whether is is the beginning of a new year, or the beginning of a new season, it is always a good time to evaluate your ministry. Think about not only where your ministry has come from, but also where it is going. If you don’t normally take time to evaluate your ministry, there is no better time than now to start. Here are 3 steps you can take to make sure you are heading in the right direction. 3 steps are more like three questions to ask yourself. This question is huge. Your vision for your ministry is yours, but it come from God. Your vision, while being yours, also needs to be in line with that of your pastor and your church. Your vision for your ministry is a big deal, as much of what you do will revolve around this. If you don’t yet have an overall vision, there is no better time like the present to get started! What did you do last year that was successful? You are not answering this question with the intent of trying to imitate the same things you did last year. It is more about seeing why you experienced success. If you are able to apply the same principles on what you do this year, you will likely be successful again this coming year. Maybe your success was attributed to your advanced planning. Or maybe it was the awesome team you have in place. Whatever you decide contributed to your success will lead you to your foundation to build on this coming year. Looking back to evaluate can give valuable insight on the direction you should take this year. Think back to the decisions you made last year. Can you explain why do did what you did? If not, it is possible you spent valuable time and energy in places you did not need to. Whatever it is you are doing, you need to constantly be asking yourself why. This will help keep you on the right track. If the answer to “why?” doesn’t line up with your vision, then you probably can find a better way to spend your time. Why are you choosing this curriculum? Why are you doing this and why aren’t you doing that? Chances are, you have an answer for most things that you did or are going to do, but if you ask yourself enough, you might just find something you are doing ‘just because’, or you really don’t have as good of a reason as you thought. By eliminating a few things you will be able to focus your time and attention on some more important matters. Spend some time thinking back to last year, as well as some time looking ahead. Ask yourself the three questions above, and you will begin to notice yourself becoming more focused and organized. You will be able to spend your time more wisely and be more productive. That sounds like a great way to start the year! How do you evaluate your ministry? What questions do you ask yourself? Post a comment and join the conversation.